Discussion in 'Recruitment into current ME/CFS research studies' started by Tom Kindlon, Apr 14, 2019. I would have preferred to share a link to where they have posted this but I can't find any such link. In October 2018, SMCI wrote about the NIH Intramural Clinical Study regarding the biological basis of ME/CFS. 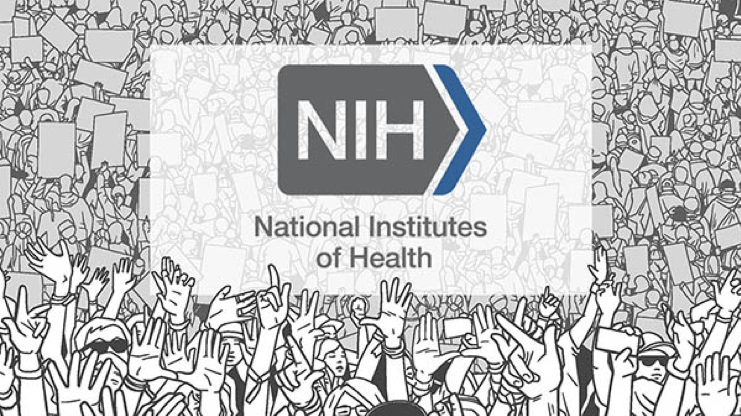 The NIH has sought greater community participation by both ME/CFS patients and healthy controls to help expand the impact of the study. ME/CFS patient Sanna Stella participated in the NIH Intramural Study with Dr. Avindra Nath and Dr. Brian Walitt, and, in January, answered our questions about her experience in the interview below. SMCI: How did you become a participant in the NIH study? Sanna Stella: The day before Valentine’s Day 2018, I crashed badly after daring to personally select Valentine’s Day treats for my three kids at a store. During this extended bedbound period of a few months, I joined an online support group, which opened my eyes to the immense suffering and neglect of the millions living with ME/CFS around the world. I know I am extremely lucky to have a supportive network of family and friends, so I felt that I needed to do whatever I can to contribute, while so many are unable to. My new enthusiasm to help move all of us towards answers and a cure led me to participate in five clinical research studies this year by searching online for studies. The NIH intramural ME/CFS study of post-viral ME/CFS patients who have been sick between six months to five years was by far the longest, most thorough, and most difficult to get into. After passing two phone interviews, the NIH collected medical records from about a year before getting sick through the present. They took care of collecting the data and even had all of my German records translated. After reviewing my medical records, I was the 15th patient who was invited to participate in the first of two potential study visits, which focused on phenotyping. SMCI: What were your expectations going into the study? What surprised you? SS: I had experiences with two quick studies at DePaul University and two 2-day studies at Stanford before the NIH study. Based on those experiences, I was surprised by several things during the NIH study. First, the fact that the NIH is able to take care of everything for their patients, including costs and arrangements for travel and accommodations for the patient with a companion. Secondly, being the government, I was surprised by their prompt and effective communication. Third, I was surprised how thoroughly they check for any other issues that could be causing my symptoms, following any possible leads and promptly consulting other specialists as needed. The NIH has easy access to seemingly any kind of testing, equipment, and experts in any field. Most importantly, however, I was surprised by everyone’s genuine interest to help patients personally as much as possible. Most research studies are only able to collect data for their own use without sharing much data with research participants for their personal benefit. The NIH shared all of their test results and reports with me and any doctor I may want to share this with in the future. And, while they would not treat research participants beyond the scope of their study and are limited in what they can say regarding the study results, they were willing to discuss their personal assessments on any issues that related to me personally. I have electronic access to test results and records just like I do with my other doctors, and the occupational therapist was available to help me with disability documentation to apply for disability benefits and support. Finally, I was surprised that the NIH expressed their continued interest in my health and any future changes or diagnoses, as all of that information could potentially inform their research. SMCI: Can you describe the day-to-day experience of being a study participant? SS: We were picked up by a driver at the airport and greeted by the study coordinator and study nurse as soon as we stepped into the lobby at the Clinical Center in Bethesda, MD. Everything was planned out seamlessly and smoothly. Procedures and doctors were on time and stayed within the allotted time. I felt taken care of and cared for the entire time. Every day, except for the weekends, there is testing during most of the day, though I did not feel rushed in the mornings, which I appreciated. The research nurse, who is completely dedicated to this study only, took me to all the testing and was always available. They accommodated my varying needs, which first meant a wheelchair, after a few days a stretcher to get to testing outside of my room, and at the end extending my stay to allow for some recovery and a change of plans from flying to a rental car to make traveling home in a reclined position possible. I was in a quiet private room with nurses available any time of the day or night. SMCI: What would you like to share about your experience with Dr. Walitt? SS: Dr. Walitt is the Lead Associate Investigator for this study. My experience with him was not what I expected from a high-profile doctor. I probably spent about 10 solid hours with him. He gave me his cell phone number to contact him any time with anything, and I did feel welcome to use it. He was always respectful, warm, approachable, and took his time. He would check on me regularly and let me know I could come to him with any concerns or questions anytime. What surprised me the most were his weekend visits for interviews and questions. He took two hours on three of the four weekend days I was there to interview me and answer any questions I could think of. He was interested in my entire life story, everything that brought me to where I am today and would often try to slow me down to get more information. He would provide detailed and comprehensible explanations for anything that came up regarding any testing they were doing, test results, or conditions I may or may not have. SMCI: Would you recommend participating to others with ME/CFS? SS: I would recommend participating in this study to anyone who feels enthusiastic about contributing to ME/CFS research, feels well enough to go through this much testing, and has appropriate support before, during, and after the study for any recovery required. It is a major commitment in terms of time and effort. It does include some discomforts and may cause post-exertional malaise (PEM). Finances should not be a deterrent, as all costs are covered and there is even some monetary compensation for study participation. If it seems to be a good fit for an ME/CFS patient, it can be a meaningful way to contribute to potential progress, gain some potentially valuable insights into their personal health conditions, and interacting with dedicated people who are working on behalf of all of us can provide much needed hope and optimism. I was since adjudicated by the NIH panel of five ME/CFS experts as a case of PI-ME/CFS (PI = post-infectious) and invited to participate in the second study visit. I was given the choice of trying the complete second study visit protocol, an abbreviated protocol without the exercise challenge and metabolic chamber, or no further participation at all. As their assessment was that I probably would not even make it to the exercise portion, let alone be able to manage on my own in the metabolic chamber based on their observations of my first study visit PEM level, I decided to participate in an abbreviated second study visit. I therefore will be admitted to the NIH Clinical Center in Bethesda, MD, again from April 7-12. Sanna and her husband, Jhon Stella, will join us for the 3rd annual Advocacy Day activities this week in Washington, DC. The work of SMCI is made possible by gifts large and small from people just like you. Inara, ahimsa, alktipping and 13 others like this. For the first time in a long time, I am pleased with everything the NIH is doing. It finally feels good to have them on our side. obeat, MEMarge, Trish and 1 other person like this. There is an MEpedia article about the NIH post-infectious ME/CFS study, and also this NIH article. alktipping and MEMarge like this. rvallee and Andy like this.